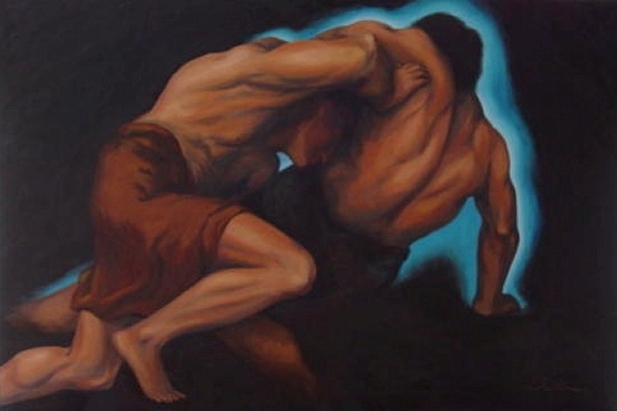 The fascinating story of Jacob wrestling with a man (Gen 32:24-32) with an angel (Hos 12:4-5) ultimately meaning with God Himself, is mysterious and intriguing. It parallels the intense struggle between our natural selves and our spiritual selves, and the struggle with understanding and following God’s will. In the story, Jacob won the fight with God and man, he demanded and received a blessing, was given a new name and identity, and was left with an injured hip so that he could never walk comfortably again. Jacob was not granted the full knowledge of God by knowing His name, but saw Him face to face and lived, with the dawn of a new day. What of our spiritual struggles? At the end of our lives, our dawn of a new day, would we not have struggled with God and man? While we persevere as Jacob did, we have God’s blessing and a new identity. The world we walk on will not feel like home. God remains beyond full knowledge but when we have wrestled and won, we too shall see Him face to face.